Black Coffee serves as a most welcome blending of the familiar with the fresh; the archetypal components of any Agatha Christie murder mystery of this ilk - the isolated country estate, an ensemble of questionable types amongst the well-to-do, more red herrings than you can twizzle a preened moustache at - are all present and accounted for, and yet in being the only stage work of Christie’s to feature her now seminal Belgian super sleuth Hercule Poirot, it feels a somewhat more distinct and special affair. Newcomer to the role yet established veteran of stage and screen Robert Powell channels David Suchet’s oft-imitated yet never bettered work in the role complimented with a charm and presence of his own, finding in both the character and play as a whole just enough bonhomie and bounce to keep the whole proceeding suitably entertaining and amusing without undermining the grizzly business of unravelling a typically obscure yet progressively accessible Christie plot of murder most foul. Christie enthusiasts will be in their element here, and even those unfamiliar with her work may find themselves won over by the safe yet compelling confines of Black Coffee, attempting to second guess or question each alibi, explanation or suspect movement. Within the grander framework of her almost dizzyingly sizeable and varied works on crime and the criminal psyche, the narrative and plot found here, surrounding the poisoning of one Sir Claud Amory (Ric Recate) a typically rich Lord of the manor who it transpires divulged in invention and even atomic science, falls somewhere in the middle ground of her achievements. As the first play she wrote, due to her apparently having been disillusioned with how her beloved Poirot was being depicted in other adaptations of her works, it lacks some of the intelligence or more ingenious plot twists of her later works, and yet also thankfully manages to avoid some of their convolution and excesses. With an impactful, art deco slant to the set design, again following the tradition of being a single locale (here an ornate library) coupled with a wonderfully authentic approach to costume and prop design, Black Coffee is one of the more visceral, characterful and convincing offerings the genre has offered of late, and proves itself certainly worthy of the Poirot and Christie labelings. The use of accompanying sound is occasional to the point of almost being sporadic, with a particular recurring piece of scoring introduced to heighten tension being initially effective but at times quite clumsily and abruptly introduced or cut out. 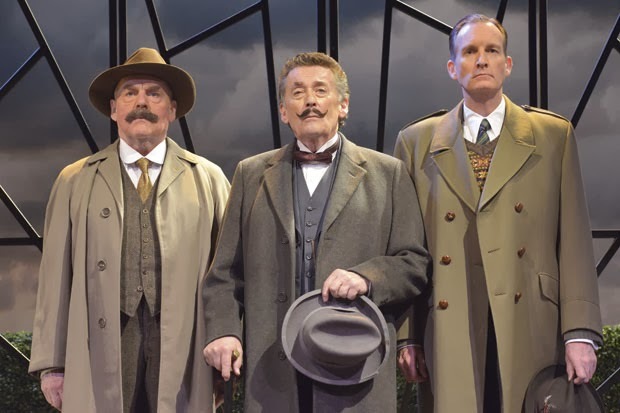 The cast are uniformly strong, with Powell as mentioned leading the company with a wonderfully charismatic turn that as mentioned softens Suchet’s edge with a dash more levity, which is welcome as an injection of energy and spirit in the second and third acts which are essentially structured as a series of ongoing discussions between Poirot and the individual suspects. And whilst Powell does a fine job of nailing the characters Belgian tang and idiosyncrasies, there is the odd wobbly accent hiding amongst the cast, most notably Gary Mavers as a highly suspect Italian doctor, and Olivia Mace as the enigmatic Lucia, though the latter in particular offers an otherwise convicted and effective performance. 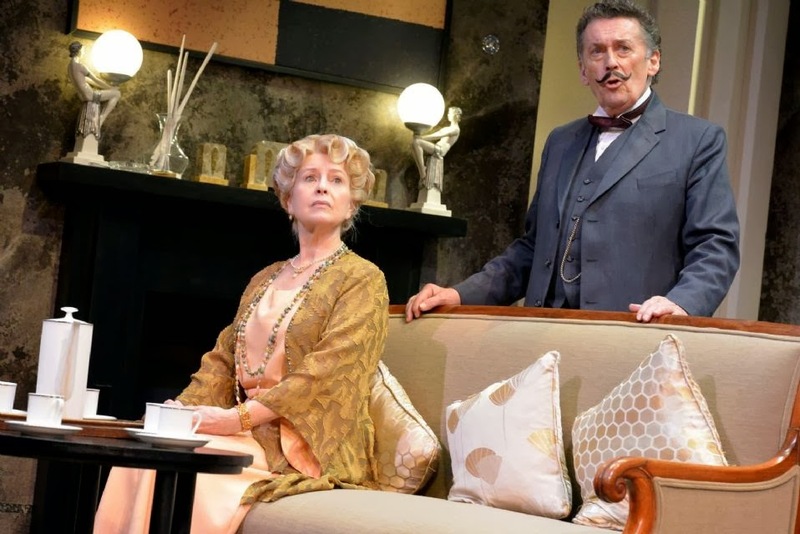 Felicity Houlbrooke is great fun as flighty young ingenue Barbara, and solid realisation of character and comedic support come from Liza Goddard as the elder Miss Caroline and Robin McCallum as Poirot’s somewhat less cerebral sidekick, Captain Hastings. One could almost argue that reviewing a production such as this to be an unnecessary undertaking, given that those going into Black Coffee will likely know precisely the kind of show and evening to expect, and those very expectations should quite comfortably be satisfyingly met. However, the character and its creator have had their names put to a cavalcade of underwhelming and amateur productions over the years, attempting to fill seats on these presumptions alone. Fortunately, Black Coffee is the genuine article, presented by the official Agatha Christie theatre company itself, and whilst being a formulaic and familiar affair, is nonetheless a perfectly entertaining evening for murder mystery, crime and theatre enthusiasts as a whole and given that extra dose of wit and warmth by a hearty central performance bringing one of literatures most celebrated sleuths back to our stages in a manner most welcome indeed. BLACK COFFEE is running at the Wolverhampton Grand Theatre from Monday 3 to Saturday 8 February 2014. CLICK HERE for more information on the shows run at the Grand and to book your tickets! Alternatively phone the Box Office directly on 01902 42 92 12. Press tickets for this performance of Black Coffee were provided courtesy of Wolverhampton Grand directly. (A)musings Media gratefully acknowledges their generous invitation.